Below, we explore the Amasty Request a Quote extension’s core features and functionality in more detail. Quotes grid in the backend. The Magento 2 Request a Quote extension provides the possibility to send custom product price requests from the category or product pages. As a store owner, you decide on which pages to show the “Add to Quote” button to allow your website visitors to send their quotes. This way, you can organize a convenient communication channel with customers to negotiate your product prices and offer personalized pricing schemes. The module’s functionality helps ecommerce business owners predict the most suitable prices for their products by analyzing customer requests. Also, individual price proposals positively affect customer loyalty and increase average order value. 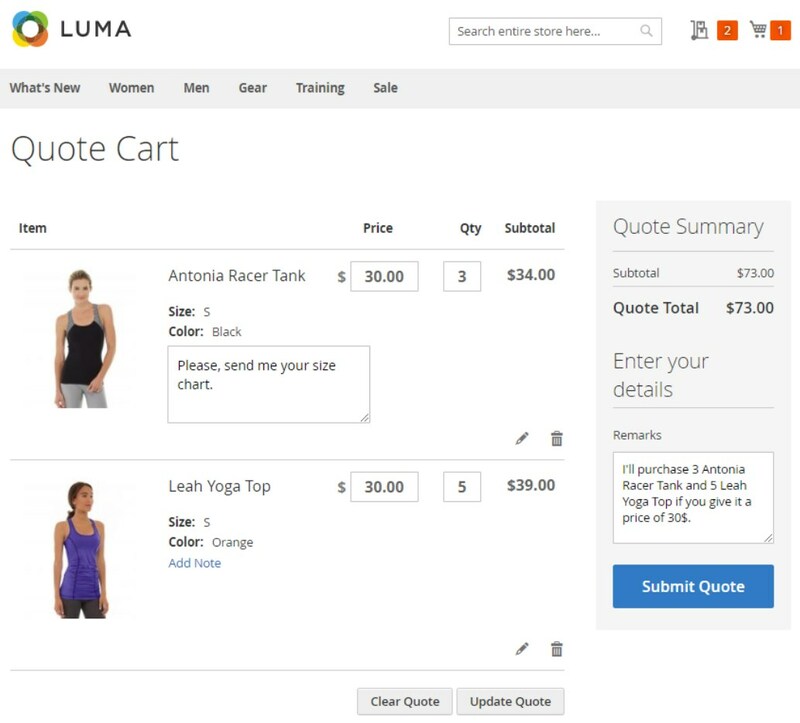 With the request quote function enabled, customers will be able to add products to their personal quotes and preview them in a mini quote cart. Furthermore, the module implements a special quote cart at your web store where frontend users can view and edit details of their price requests. Customers can also add notes per each item in the quote cart and leave comments in a separate field to clarify their price proposals. The Magento 2 quote requests module allows customers to submit price requests for an unlimited number of products. Besides, the extension supports multiple product types, including simple, configurable, virtual, downloadable, and grouped. 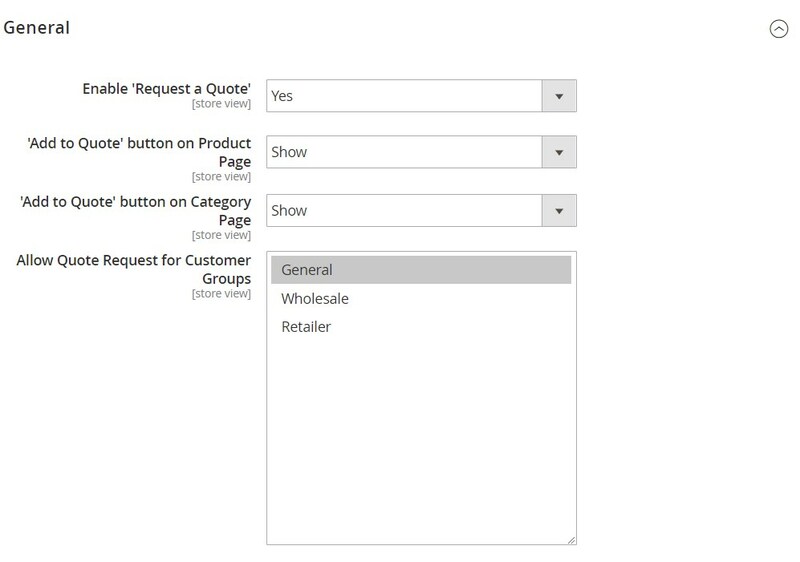 The Magento 2 Request a Quote extension adds the “My Quotes” tab in customers accounts where they can view and manage all their requests. The dedicated section shows all important details about a customer’s price requests along with their status. After an admin approves a quote, a user can move the items from the quote with the negotiated price to the shopping cart in one click. As for backend configuration of the extension, admins decide to which customer groups the call for price functionality will be available. For example, you could allow creating quotes only for logged in users or provide custom pricing to your wholesale customers. Magento admins can also configure email notifications sent to customers. It is possible to send email alerts to confirm a quote submission, inform about admin changes in the customer request, as well as when a quote is approved and removed. 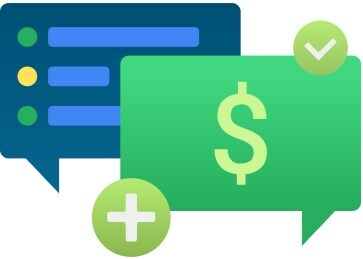 Admin users can track and manage all customer requests for custom pricing on a dedicated grid. The Quotes grid allows to accept and reject price requests in bulk, as well as modify the suggested price and products quantity for each quote individually. After making sure that all quote terms are satisfactory, you can approve the request with one button click and then instantly convert it into order. So, let’s see how the Magento 2 quote module’s functionality can be adjusted in the admin panel. Action (you can open the quote page by clicking View from here). The Request a Quote extension allows canceling and approving quote requests in bulk by selecting appropriate action from the drop-down list. Also, it is possible to apply filters to all grid columns (except checkbox and Action) and change their sorting order. The Quote View page is divided into a few sections: Quote & Account Information, Quote Items, and Quote Total. If you click on the Edit button at the top right corner of the page, some of the fields will become editable. Note that the edit function applies only to requests with the Pending status. You can also approve a quote with the same status in one click from this page by clicking the appropriate button. In Quote & Account Information, you can check a quote number, submission date, status, websites where it was created, and relevant IP. You can also leave comments here. The Aсcount Information block in this section shows a customer name, email, and group. It is possible to edit customer information from here. 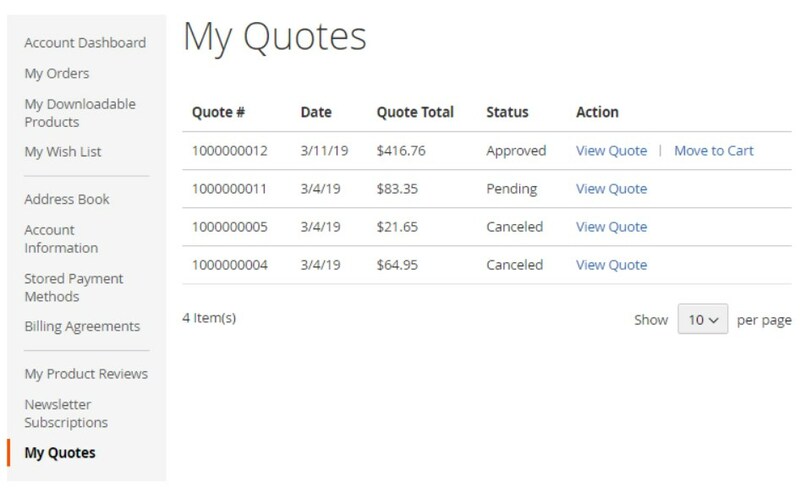 In the Quote Items block, you can view and edit the quotation price and the number of products requested. The section also shows a product name and SKU, subtotal, and row total. The Action drop-down menu allows removing the quote. Besides, it is possible to change the parameters of the quoted items right in this block by clicking the “Configure” button, as well as add other products to the quote. After making necessary changes, don’t forget to press “Update Items and Quantities”. 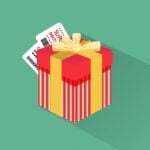 In the last section on this page, you can add notes for the quote and view the total quote price, including subtotal, shipping and handling fees, and taxes. The configuration screen of the Amasty Request a Quote extension is divided into 2 sections: General and Customer Notifications. In the General settings, enable the module, decide whether to show or hide the “Add to Quote” button on the product and category pages, and select customer groups for which you want to allow quotation functionality. In the Customer Notifications tab, select an email from which you want to send notifications and choose templates for alerts sent to customers on the quote submission, approval, modification, and cancelation. Now, let’s explore the quote submission and management procedure from the customer perspective. As we’ve mentioned above, your website visitors get the possibility to add quotes from a product or category page. 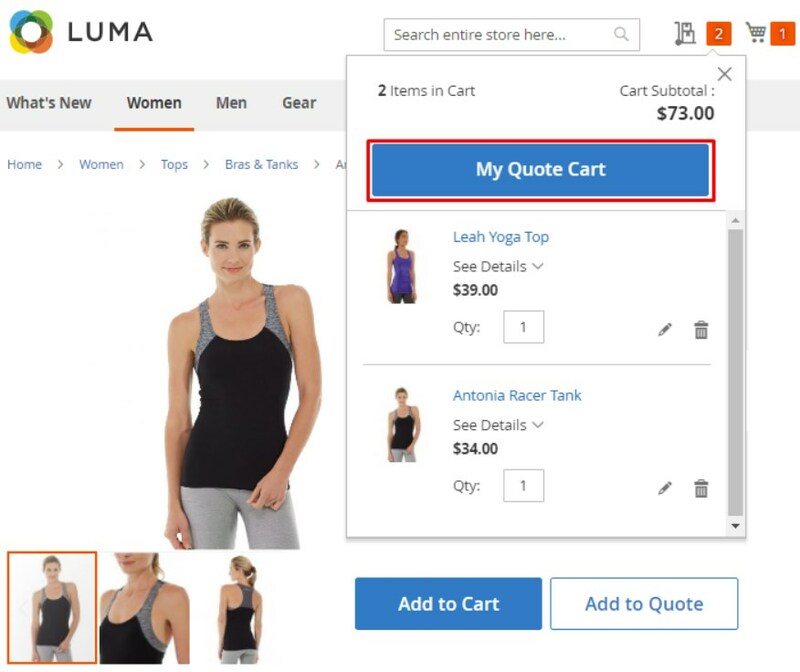 The module places an “Add to Quote” option next to the “Add to Cart” button. 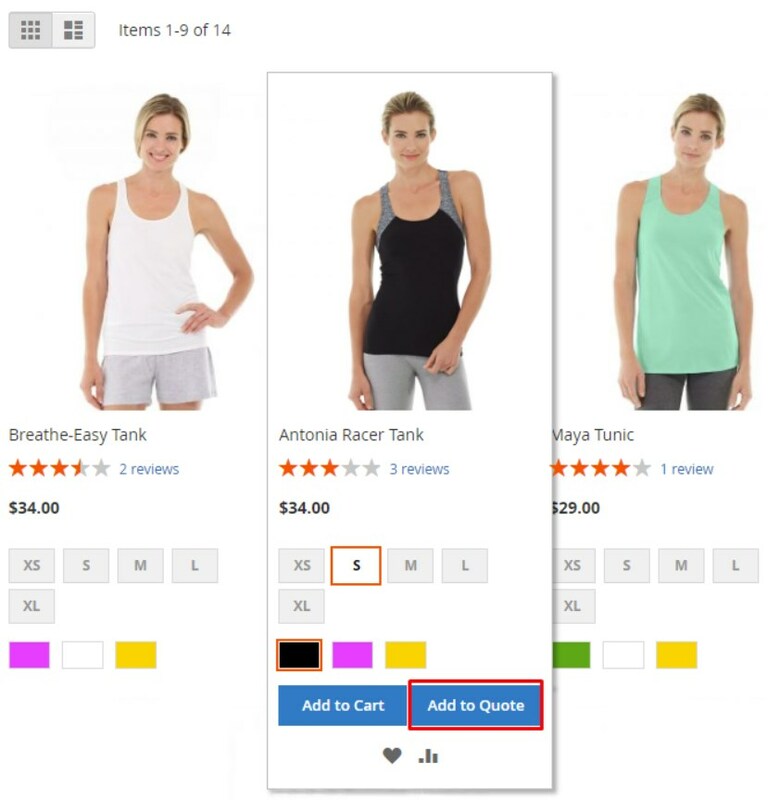 Besides, the Magento 2 call for price module adds a quote cart icon to your web pages. 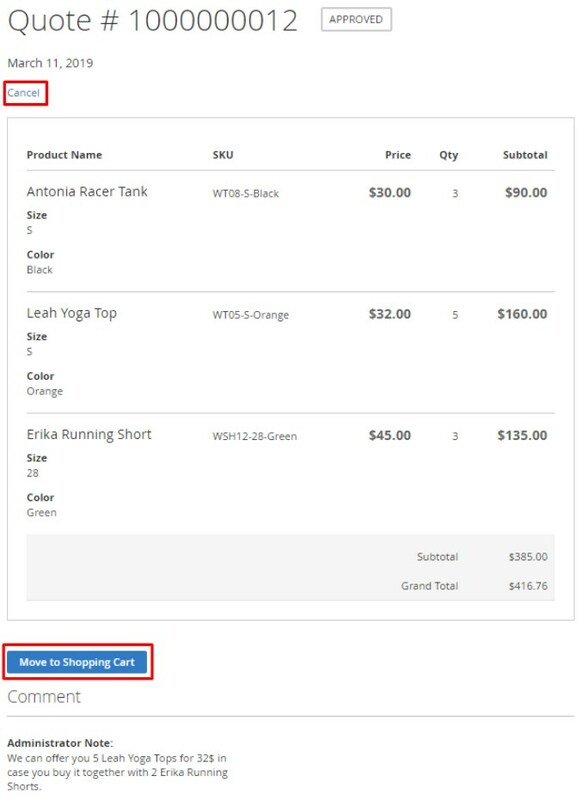 After a customer adds products to a quote request, they can quickly check which items their quote cart includes by clicking on the icon. After pressing on “My Quote Cart”, a user will be redirected to his or her quote cart. On this page, customers can specify the price for the quote and adjust the product quantity. Besides, they can add notes to each item in the request and write remarks related to their purchase. 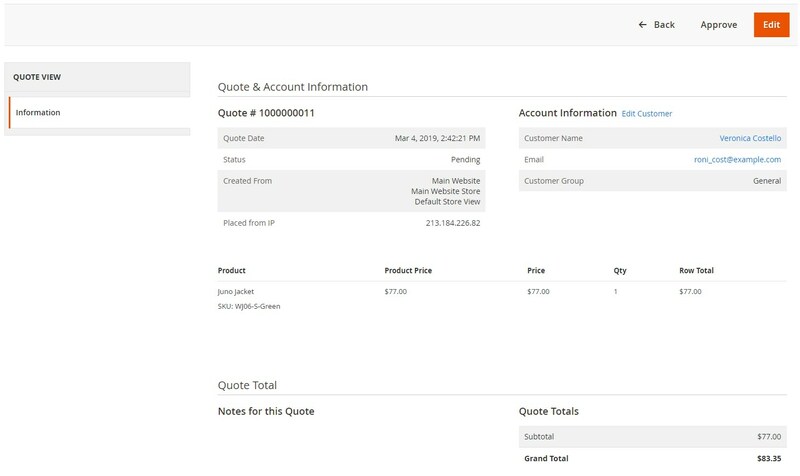 Next, the cart page allows customers to submit a quote, as well as clear or update information in the request. The Amasty extension adds the My Quotes tab to the My Account area on the storefront. Here, your clients can see each of their submitted quote’s ID number, date of creation, quote total, and status. As for quotes management, it is possible to view details of the requests and move products from approved quotes to the shopping cart in one click. On a quote page, there is an option to cancel the request. This feature can be applied if a customer doesn’t agree to the terms offered by the store owner after admin approval. 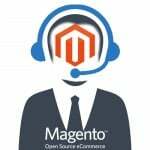 Amasty Request a Quote for Magento 2 is a robust tool for implementing the call for price request functionality on an ecommerce site. The extension provides a user-friendly interface for both customers and admins, letting them to quickly create and efficiently manage the quotes. With the request quote feature, website visitors get an enhanced user experience due to the option to offer their own product price. Store owners get the possibility to modify submitted quote requests to set the most suitable price for the items they sell. Thus, the module helps merchants boost their sales and revenues, as well as increase customer engagement and repeat purchases. You can buy the Amasty Request a Quote Magento 2 extension for $149.